The King Solomon Oracle Cards are reading cards that relate directly to ancient Jewish symbols, containing King Solomon seals and the "72 names of God". This is the second edition of the deck, with four extra personal amulet cards, published by US Games. Back Design Pale blue with a black printed seal in the centre. The cards themselves are meant to help the reader the significant situations and profound questions that life places in our path. They provide powerful insight into current situations and future outlooks. The lens of perception, or the focus of this deck is the wisdom of King Solomon. The magical signet ring that he received from the heavens inspired the seals that have become powerful symbols in Judaism, Christianity and Islam, and are widely used in charms and talismans. The seals carry different frequencies that relate to different life situations and physical characteristics. Each card contains several different types of symbols. There is a Solomon seal that looks like a stamp, some cards carry a Goatic symbol, which represents specific energetic traits, while other symbols are frameless text written in ancient script. The texts incorporate the “72 names of God” – kabbalistic names that represent unique strengths, and are in angel writing. The placement of the seals and text varies, according to the layout of the artwork. The mystical symbols are meant to connect the Seeker spiritually to the essence of their inquiry. In other words – to the spiritual response to their inquiry. The deck was created to be used as a personal deck for daily use. Morning reading help prepare the Seeker for the day ahead. In the section on reading the cards, there is very good advice about inhaling light and positive energy before doing a reading. The Seeker is advised to connect with the cards, and put their faith in the responses. It is highly recommended to read for a single question at a time. Interesting advice is given on drawing a single card, and having that card be either unclear or irrelevant. The Seeker is advised to stop he reading, because the situation the Seeker is inquiring about, or the day ahead, is unpredictable. The Seeker is advised to accept and embrace whatever comes their way. Situation: There’s plenty of time, no need to rush / progress depends on timing / time will work things out / things proceeding slowly / time is on your side. Person: Someone who examines the situation thoroughly while taking all the time that is needed. Advice: Proceed with patience / take the time to think things through and get it right / pace yourself. At the end of the LWB three spreads are presented: a one card spread, a three card spread, and a four card spread. Note: The spreads as presented are read from right to left. It is noted that a clarification card can be drawn if a card seems vague or unclear. It is then placed over the ambiguous card. The cards are approximately 2 ľ” by 4 5/8”, of good quality cardstock. The backs are a light blue, with a seal in the center and background text in light gray/white. The card faces have a Ľ” white border, with the card number in either the upper right hand and lower left hand corner, or the upper left hand and lower right hand corner. Each card contains a seal and text, placed according to the imagery in the card. The artwork is in basic colors, drawn in a very whimsical, uncomplicated manner. In card number 8 (Unity/Partnership) the bodies of the figures are a clear gray/white, very ghost-like and can be seen through. In many of the cards the figures are floating through the air. Card number 30 (Devotion / Perseverance / Believing In Your Path / Sacrifice) the outer walls of the house are a yellow and green mystical checkerboard pattern. Card number 22 (Magical Influences / Spells / Evil Eye) shows the outline of the house in light gray/white. 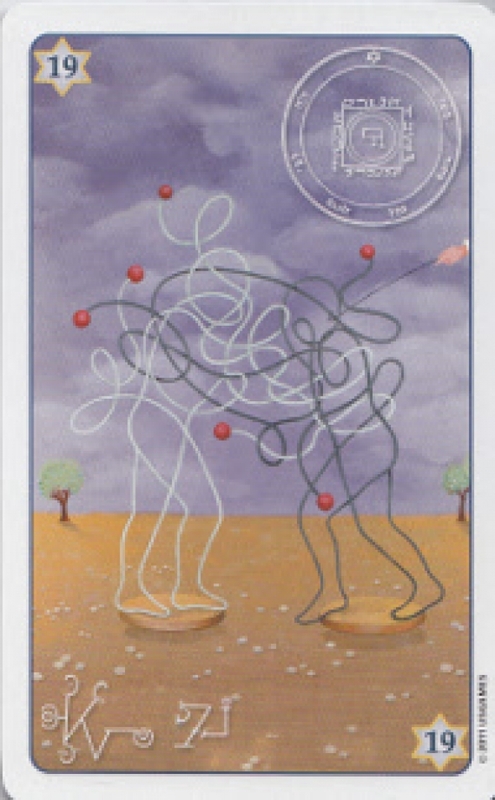 Card number 19 (Sexuality / Romance / Seduction / Intense Involvement) shows the outline of two figures – one in dark gray, one in lighter gray/white. Card number 11 (Flexibility / Leniency / Compromise / Tolerance / Forgiveness) shows three figures flying between two pillars. Cards number 10 (Growth / Development / Achievement / Discoveries), 24 (A Favorable Era / Positive Conditions) and 6 (Happiness) show figures with red outlines for heads. Card number 28 (Delays / Obstructions / Blocks) shows a seated figure wearing a fools cap, with a see-through w hite veil over his head and pinned to the earth at the four corners. I found the artwork and imagery to be very magickal, drawing the Seeker into the picture. The readings that I have done for myself have been very appropriate and enlightening. The deck works for me in a very deep way. Seekers from all backgrounds would have no problem working with this deck.